HEY! 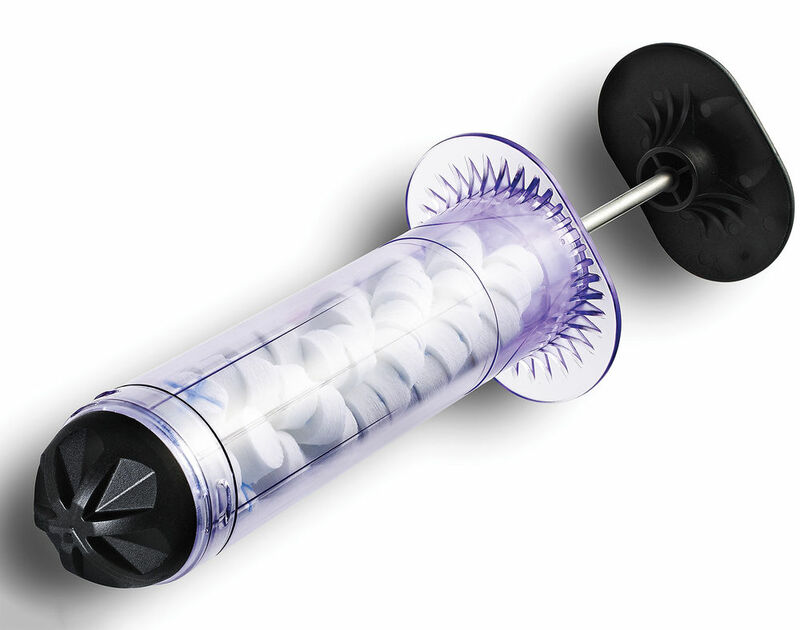 This Bizarre Gunshot-Plugging Thing-a-Majig Just Saved Someone’s Life! 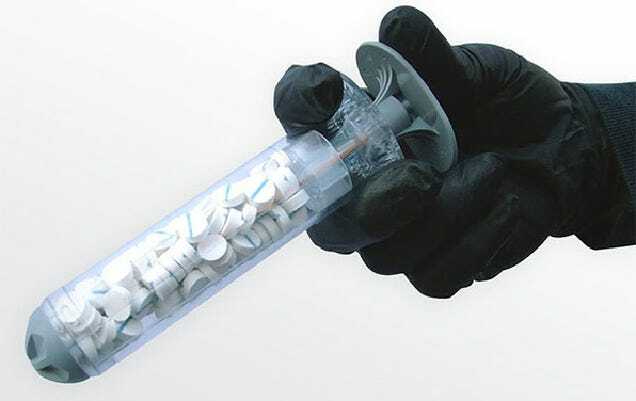 This is the XSTAT Rapid Hemostasis System, an innovative sponge-filled dressing hemostatic device developed by RevMedx Inc., which works by pumping expandable, tablet-sized sponges into a wound, stanching bleeding while a patient is rushed to hospital. Recently, the XSTAT was used to save the life of a coalition forces soldier who was shot in the leg, and it’s the first documented clinical use of the product, originally approved for military use back in 2014. Also, late last year, the U.S. Food and Drug Administration approved XSTAT for use in the general population. The XSTAT treats severe bleeding in areas susceptible to junctional wounds, like the groin and the axilla (the area located under the shoulder where vessels and nerves enter and leave the upper arm). 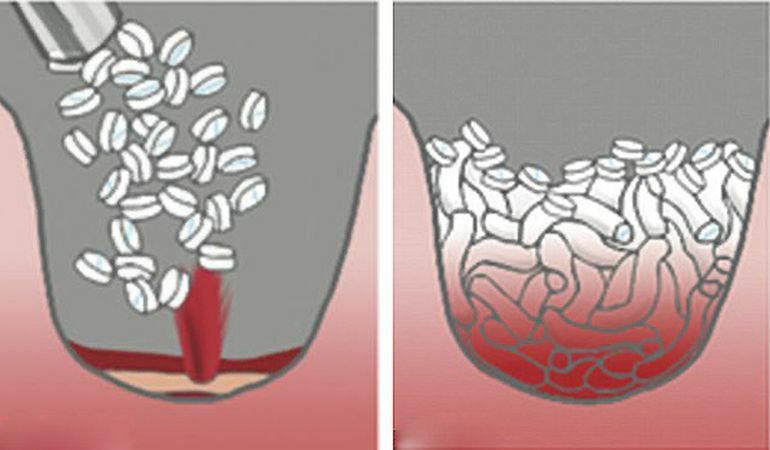 When injected, the sponge-like tablets expand rapidly within the wound and exert hemostatic pressure, stopping the bleeding. In addition, each sponge contains an x-ray marker to confirm surgical removal after surgery. The femoral artery and vein were transected and damage to the femur and soft tissue left a sizable cavity in the leg. After a self-applied tourniquet stopped the bleeding, the patient was transferred to an FST for evaluation and treatment. After proximal and distal control of the vessel was achieved, several hours were spent by the team trying to control residual bleeding from the bone and accessory vessels. Throughout the course of the roughly 7-hour surgery, multiple attempts at using bone wax and cautery on the bleeding sites were unsuccessfull and the patient received multiple units of blood and plasma. Eventually, the FST team opted to use XSTAT and applied a single XSTAT device to the femoral cavity— resulting in nearly immediate hemostasis. The patient was stabilized and eventually transported to a definitive care facility. After this great first result, it appears that RevMedx’s hope will come true soon, as now emergency responders will have an extra confidence boost knowing that this innovative and unorthodox device really works.